This Error Message Article explains the SENTINEL error message “Can’t connect with the Label Archive Server” and details how to fix the underlying problem that caused it to appear. This message is observed in the SENTINEL logs when attempting to start a watcher in SENTINEL. The software is attempting to connect to LABEL ARCHIVE to retrieve a label for a print job, but is unable to connect to the server hosting LABEL ARCHIVE. A possible reason for this is improper credentials configured in SENTINEL to connect to LABEL ARCHIVE. 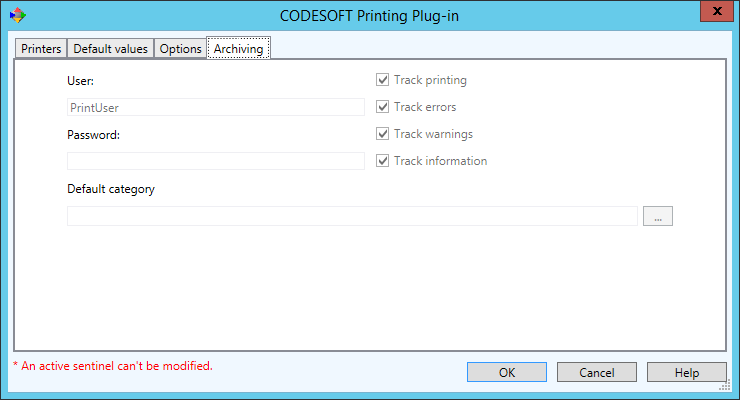 You can check the credentials of SENTINEL into LABEL ARCHIVE by navigating to the CODESOFT Printing Plug-in ‘Archiving’ tab. Here the user ID and password are identified that will give SENTINEL access to LABEL ARCHIVE files.